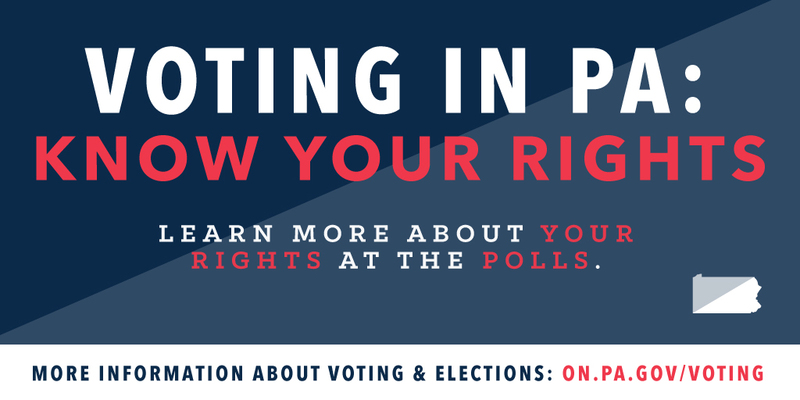 As Election Day is less than two weeks away, it is worth every Pennsylvania voter learning more about their rights in this process, especially at their polling place. The Department of State’s Everyone VotesPA initiative has materials to help you navigate your rights, including the Top 5 Things Every Pennsylvania Voter Should Know and the 2016 Voter Guide. Voters have a right to assistance when voting. You have the right to assistance at the polling place, including foreign language or literacy assistance. You may select any person to assist you as long as the person is not your employer or union representative or the Judge of Elections. Only first time voters in precincts must show identification (ID). Voters voting for the first time in their precinct must show ID. The ID can be photo or non-photo ID. This is the only time ID is required. Pennsylvania’s strict photo ID law for all voters is no longer in effect for voting at the polls. Unless you are voting for the first time in your precinct, poll workers should not ask you for photo ID, and you will NOT need to present ID to vote in the 2016 Primary or General Election. If you are voting for the first time in your precinct, and you show a non-photo ID, it must contain your name and address. The only other voters who need to show ID are those who may need to verify that their address is correct. A voter whose name is not in the poll book can still vote. When you go to your polling place to vote but your name does not appear in the poll book or supplemental poll book, you can still vote. The local officials should place a call to the county board of elections to confirm your registration. The board of elections can determine whether you are registered and in the correct precinct. If you are registered but you are in the wrong precinct, you will be directed to the correct precinct. If the board of elections cannot find your name in its voter registration database, or if you are unable to go to another precinct, you are entitled to use a provisional ballot. If you vote by provisional ballot, the Judge of Elections will give you a receipt with your provisional ballot number. You can find out if your provisional ballot was counted by visiting pavoterservices.state.pa.us or by calling 1-877-868-3772. When 50% or more of the voting machines are not working in your polling place, you have the right to vote by emergency paper ballot. If 50% or more of the voting machines in your polling place are out of service, voters are entitled to vote by emergency paper ballot. Poll workers should immediately offer the ballots, but if they do not, voters should request one instead of leaving without voting. The paper ballots used as emergency ballots must be clearly identified and placed in the envelope marked “emergency ballot” and not in the provisional ballot envelope. Visit on.pa.gov/voting to learn more about voting and elections in Pennsylvania.